They are yet to publicly set a wedding date. 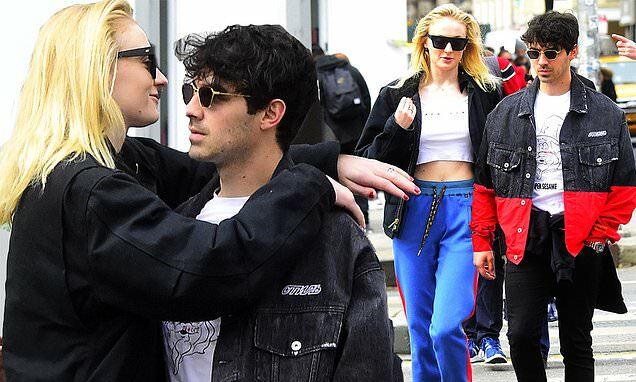 But Sophie Turner and her former boybander future husband, Joe Jonas, looked very much in love as the pair roamed around New York on Friday. The couple were seen strolling around SoHo arm in arm, before Sophie turned to hug her fiance in the street. Enjoying a brief respite from the wintry weather, the two wore just T-shirts and jackets on their stroll. Sophie, 23, and the Sucker hitmaker got engaged in October 2017 following almost a year of dating, and she has previously revealed she was enjoying her engagement. The Game Of Thrones star said: 'I'm still like: Holy s**t! I'm engaged. It's lovely to be engaged. Not like I achieved anything, but I found my person like I'd find a house that I love and want to stay in forever.